Our Blue Sky Sun Visors incorporate an innovative design with high quality materials and low cost to provide a significant increase in flying safety and comfort. 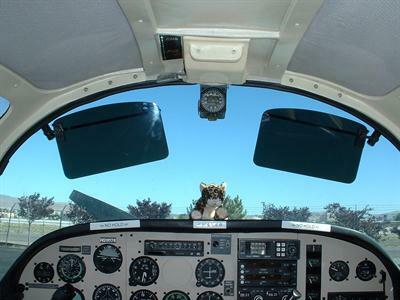 We manufacture and supply sun visors for all of the Grumman single engine aircraft and Van's Aircraft RV-10. This year we also designed and produced a new model of the sun visors for Glasair Aviation's Sportsman 2 + 2 aircraft. As time allows we can also produce custom visors parts for airframes such as the Piper PA-28 airframe and the older Beechcraft Bonanza airframes. All of the major components of our sun visors are manufactured and assembled at our facility in Reno, NV so we can insure the utmost quality before we ship to our customers and sales agents. Sales, parts and service are provided throughout the world by the agents listed below. Blue Sky Sun Visors are manufactured in our shop facility with only a few parts purchased from outside vendors. All of the manufacturing and accounting work is done by Vern. Since I have been retired for several years and have outside income, my primary motive is not profit but instead to provide a useful product for Grumman, Glasair, and Van's aircraft. Because of these circumstances, I am able to provide our Blue Sky Sun Visors at less than half the cost of other comparable products. While we don't consider our company a hobby, we enjoy what we do. Living in Reno, where there are a lot of other opportunities, this work and my community involvement keeps me out of most mischief. Installing our Grumman line of sun visors is a simple, and quick 3-step process requiring nothing more than a wrench and screwdriver and knowing how to use them. In a nutshell, the steps are (1) prepare the visors for installation, (2) remove the existing screw & nut from the windshield bow, and (3) attach the the sun visors to the windshield bow. A more detailed step by step description is provided on the Grumman Installation Guide pages.